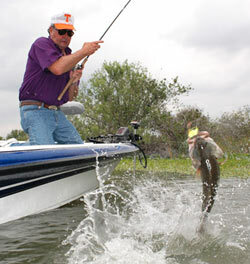 Television Career: "Bill Dance Outdoors" has aired since 1968 with over 2000 shows in its history. Bill has produced over 36 educational videos and 12 audio educational tapes on a variety of subjects. His 4 hilarious out-take shows or "Bloopers" have been aired all over the world. Promotional Work: American Heart Association, American Cancer Society, Arthritis Foundation, Make a Wish Foundation, Dreams Come True, Carl Perkins Child Abuse Center, Catch a Dream Foundation, Oudoor Dream Foundation, St. Jude Children’s Hospital, Children’s Museum, Ducks Unlimited, Sea World, Cypress Gardens, U.S. Forest Services, Tennessee Department of Tourism, the U.S. Coast Guard, U.S. Army Corp of Engineers, Florida Game & Fish, Arizona Game & Fish, Mississippi Game & Fish, Louisiana Game & Fish, Alabama Game & Fish, Arkansas Game & Fish and Texas Parks & Wildlife, Sara Lee, Kroger Food Chains, Tyson Foods, Evan Williams Distillery, Anheuser-Busch, Du Pont (Agri Division), Banquet Foods, Underwood Meats, Bryan Foods, Keebler Company, Napa Auto Parts, Rancho Shocks, Auto Zone, and Champion Spark Plugs.